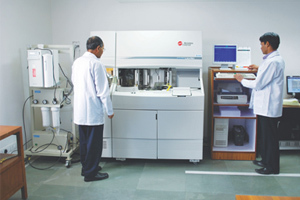 The Asian Clinic has a Sample Collection Centre which is supported by Laboratory of Asian Institute of Medical Sciences, accredited by National Accreditation Board for Testing and Calibration Laboratories (NABL). The accreditation is granted in terms of technical competence, testing methods and calibration on international standards. Hospital laboratory is a single window provider of all pathology services including out sourced investigation wherever required. The laboratory maintains standard equipment, which are regularly calibrated and certified by the service provider for its efficient working. Internal and External Quality Control and Assurance programs are carried out on a regular basis as per the recommendations of NABL (ISO 15189). Entire laboratory staff possesses high standards of professional competency as well as thorough professional conduct. Laboratory strictly adheres to the procedures laid down in the Quality Documents of the laboratory. No deviations are acceptable or permissible. Entire set-up and work systems are based on the guidelines of the CLSI (Clinical Laboratory Standards Institute, USA), GLP and GCP.